Open source for the sake of it is one thing. This is open source hardware and software for the sake of making lighting more awesome. Open source hardware is the basis of a sophisticated, wireless lighting rig. It’s already syncing to music with Pd, and automatic lighting control right from free DJ software may be next. With the effort of the open source music and visual communities, that could be just the beginning. An open source shield compatible with Arduino and Maple for power switching and high-performance UDP and OSC over WiFi. The full Saiko5 lighting project with the shield, the brick, an Arduino, a power supply and the custom case. The project itself is interesting on its own, as are some of the building blocks that make it up. There’s tons of tasty stuff here for wireless OSC and UDP and dealing with power for lights, and they’re even working on a live CD of software to work with it. A demonstration of 15 Saiko5 LED Light Fixtures being used in combination with audio analysis software in the new “random flash” mode. This mode makes it so that on every beat in the music, the light switches to a new random color, at least 30 degrees away from the current color in hue. The saturation is randomized between 0.8 and 1.0 to allow for pastels. RJ Ryan, lead developer on the Mixxx open source DJ project, writes to tell us that he hopes to implement the OSC message format used here into his Mixxx software, allowing for some powerful DJ+lighting applications. This looks like a terrific project, and I’m likewise impressed by the progress Mixxx has been making, so hope we’ll cover this more. Questions? Let’s hear ’em. 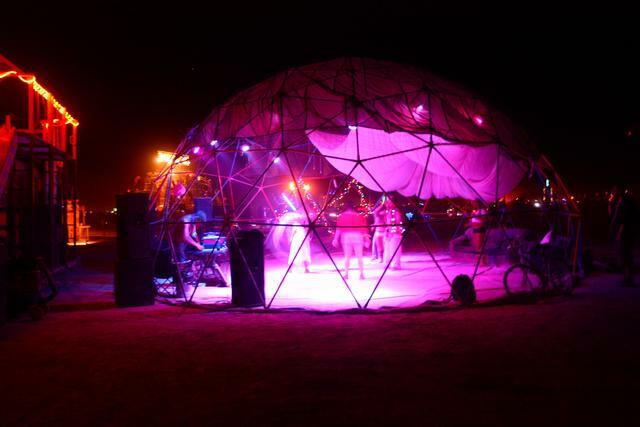 Make plans now to take them to Burning Man, as seen below.